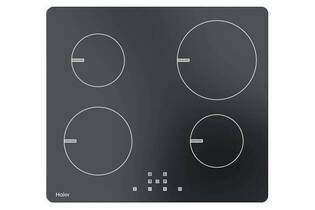 Snapshot: The Haier HCI604TB1 induction cooktop has 4 cooking zones in a range of sizes. How well does it cook? Good results in our white sauce test. OK results in our stir-fry test. Has 4 cooking zones in a range of sizes. OK cooking zone layout (small zone at front, large zone at rear). Cookware larger than 21cm diameter may not be efficient. Little variation between heat settings 1-9. Difficult to simmer foods as they can overcook and boil over. No separate on/off indicator light.